When you see the somber brown hills of the Dakota Borderlands for the first time, they don’t look like the setting for a historic victory by a people armed only with the power of prayer and reverence for the land. Yet among these hills of Standing Rock has sprouted a camp, a human crossroads whose unique character has made the seemingly impossible happen. Seven tribes lead this movement and among the tribal elders are men like Wanasa, a Lakota elder who greets everyone warmly during meal times in the main kitchen. This comes as something of a shock to many newcomers who assumed that the direct actions were the most powerful way to participate in the movement. Wanasa, whose name means “they chase a buffalo” in the Lakota Language, encourages everyone to identify their spirit animal. “Everyone wants their kids to be buffalos or bulls but not everyone is a warrior animal. Some are ants and they are just as important,” he says. Wanasa recounts when horses were first introduced to the Lakota and how his people immediately connected to their spirits. 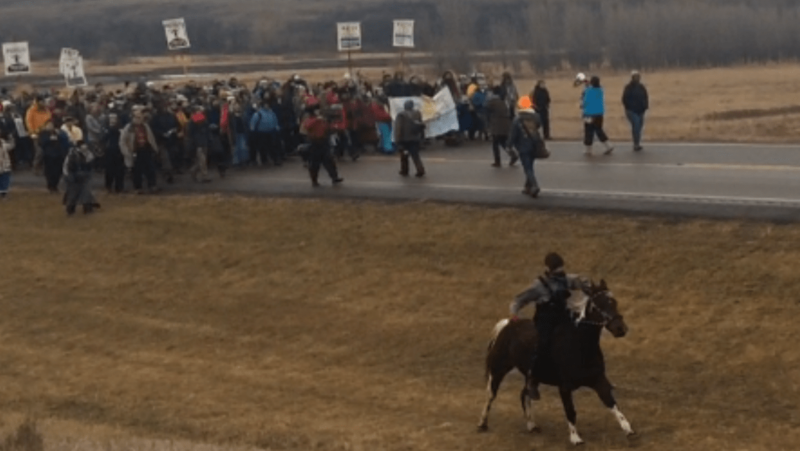 He speaks of this historical event as if it could have happened yesterday and the newly arrived water protectors glimpse a world where the past still lives in the present, where people are not wholly individuals but part of a larger tribe. The stories of many of the people who have come to join the movement move easily through western and indigenous realities. Patricia Zapata, the great-great-grand daughter of Mexican Revolutionary leader Emiliano Zapata, says that it was his spirit who sent her to the camp. She was working in the main kitchen but then decided to start her own kitchen where she feeds 50-60 people per day. Her love of cooking and thorough knowledge of traditional Yaqui cuisine allow her to both serve and educate the community. 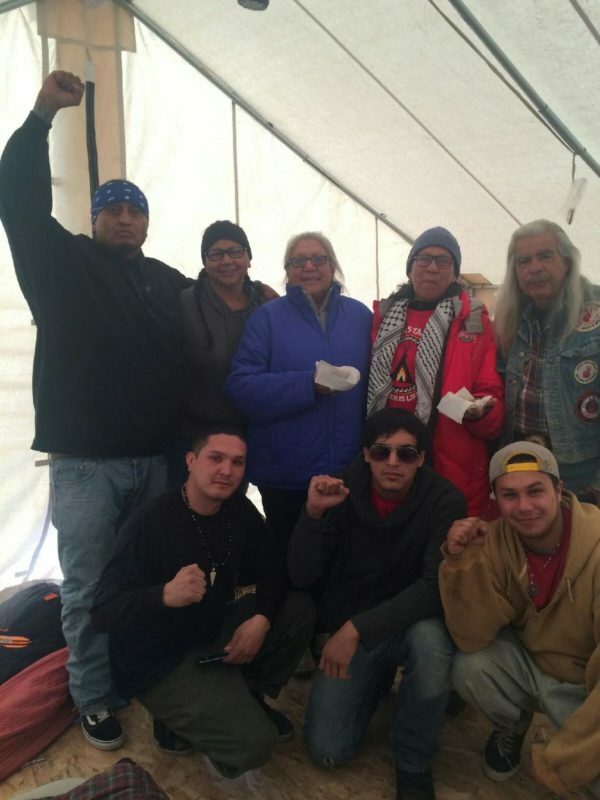 Native Americans from all over the country have come together to stop construction of the “black snake” (Dakota Access Pipeline) and to contribute their own unique skills to the camp. Miengun Pamp, a member of the Ojibwe tribe from Michigan, quit his job as a security guard and moved to Standing Rock in September. He is now a lead security guard at camp and plans to stay permanently until construction of the pipeline has been stopped. “As soon as we heard of what was going on, I knew I had to come and so did my whole family,” says Pamp up on Facebook hill, the high point of the camp where wireless signals reconnect water protectors to the larger world. The tradition of silence has deep roots in this culture, he explains. When Native American chiefs used to meet for political proposals, one would never answer the other immediately but would wait in silence for days before replying. Another unique facet of the movement is the prominent role of women. Phyllis Bald eagle, a member of the Cheyanne River Sioux tribe, holds a key leadership position in the Seven Council Fires. 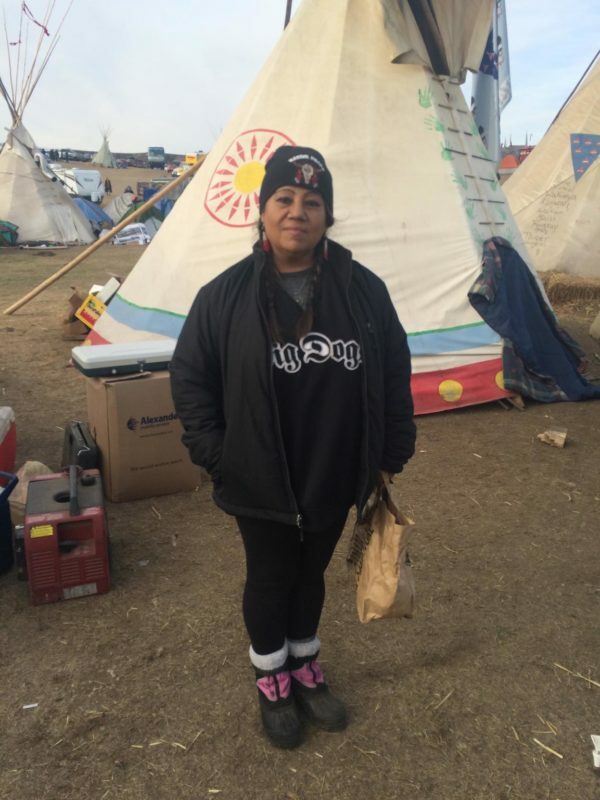 “We want everyone at camp to stay calm,” she says in the aftermath of the night when water protectors were attacked by police with water cannons. 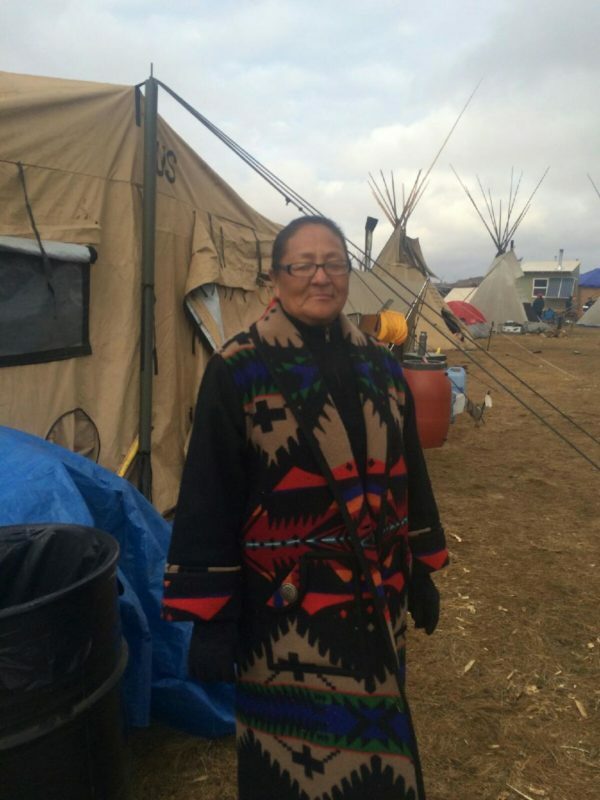 Phyllis was one of the women leading the water protectors in prayer during the actions, ensuring that the protests remained peaceful. Jason Pinto, a Kumeyaay from Jamul India Village, California, was on the front lines the night that protesters were attacked. He saw many people who were peacefully marching attacked by water cannons, rubber bullets and tear gas. “I arrived the night of the action and went straight out there,” says Pinto, who works closely with the American Indian Movement. Like many who were there that night, he rejects the media stories that the protesters started a fire. “The fire was started by one of the police canisters. It was used by medics to help people who had gone into hypothermia,” he says. The Lakota people’s determination to regain control of their lands and stop the Dakota Access Pipeline has sparked a movement that has unified Native American tribes from all over the country. The recent victory, temporary as it may be, is still an amazing testament to the power of the movement which takes on the combined powers of corporate and militarized America. Ariana Krieger is an educator, activist and recent graduate of UC Riverside. You mention the story told by Wanasa, a Lakota elder at the DAPL encampment, that “…when horses were first introduced to the Lakota… people immediately connected to their spirits.” That sensing of the natural which leads to connection with it can only be achieved by listening and watching and letting the world enter and speak to us. The passage reminded me of another, this one from Primo Levy, telling of a young shepherd who “had a curious mimetic talent, and when he talked about cows, chickens, sheep and dogs he was transformed, imitating their way of looking, their movements and voices… and seeming to turn into an animal himself..” Fact is, I can better imagine what’s going on in a dog’s mind than I can Donald Trump’s. Maybe we’ll get back to a preference for reality after we get past the all-consuming noise we live in. Yes! And what a great passage of Primo Levi. Wanasa also talked about the importance of connecting to ones spirit plant, which is different for each person and also requires that we let the natural world enter into us. His spirit plant is lavender cones, he says that they seem to sprout up to soothe him every where he goes. The natural world has so much to teach us all of us if we are willing to listen.